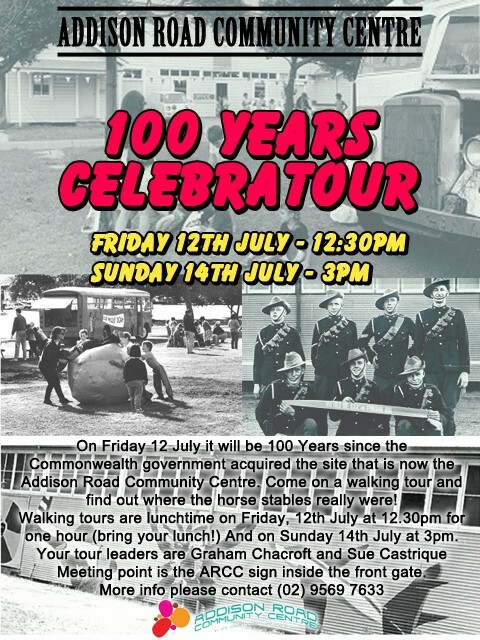 On Friday 12 July it will be 100 Years since the Commonwealth government acquired the site that is now the Addison Road Community Centre. Come on a walking tour and discover the amazing history of the Centre, from its unique indigenous history, to its utilisation as a military facility through to today as a thriving and progressive community centre. Walking tours are lunchtime on Friday, 12th July at 12.30pm for one hour (bring your lunch!) and on Sunday 14th July at 3pm. Your tour leaders are Graham Chacroft and Sue Castrique. Meeting point is the ARCCO sign inside the front gate. For more information, please contact the Main Office on (02) 9569 7633.